Photos courtesy of Chup from www.g503.com “Picture from the 804th Ordnance Company, 104th Infantry Division from Holland in 1944. Has a few interesting mods and I know you’d appreciate the view of the wipers. 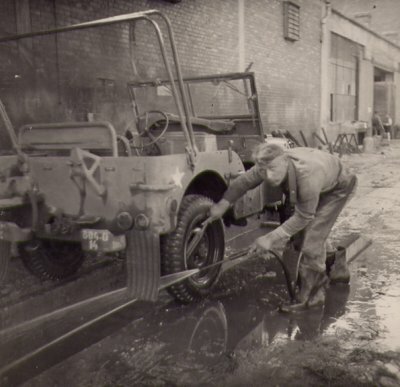 804th was light maintenance company permanently assigned to the 104th.” Note the vacuum wipers. One is mounted “up” and the other is mounted “down”. Going to lose points at the car show for sure! Also take notice of the stylish mud flaps. 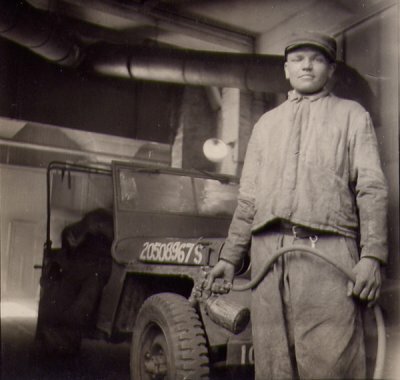 Not sure that this fellow is a US soldier, maybe a civilian “contract” employee in newly liberated portion of Holland. Notice the greased over windows. You might try that next time instead of mucking about with paper. Also notice the carefully placed registration number. And no that’s not a picture of me getting ready to spray down Frankie in my friends barn.